There was once a time in India (probably identified by period preceding Independence) when being a Shudra was a curse to the life of the individual. Driven by equity and the desire to bring those who had been victims to these times of discrimination and suffering, the Constitution of India made provisions for Scheduled Caste and Scheduled Tribe. Initially we provided an affirmative action programme whereby certain seats were allocated for these categories in schools, colleges, political institutions etc. This was considered to be a transitional arrangement, to last for ten years, whereafter there would be no second-grade citizens. However, as usual, the period was extended every ten years and now the things stand that it has been extended till 2026 whereafter the next review will take place. On the other side of affairs, we also extended the form, nature and amplitude of benefits to these backwards classes (which also included, besides the SC/ST, 'other backwards classes'). We provided for reservation. Indian legal and political history is replete with the violent reactions and bloodshed aftermath, coming from those who fell in the General Category. This was primarily due to the then Government (led by Mr. V.P. Singh of the Junta Party) with followed the decision to allocate quotas for the backward classes (or more specifically implementing the Mandal Commission recommendations). The most prominent example of this backlash was the suicide of Rajiv Goswami, who gave his life only because of the inequalities and inequities that were being introduced through this fractured and ill-thought policy decision. And this was in 1990. Times have changed, but not much since then. Every now and then, there have been attempts to increase the scope of this reservation system in terms of both the magnitude and areas of application. The battle is now in courts and therefore being sub-judice, I would not comment on it. But there are few interesting observations to draw from it. (1) The policy-led-decision of introducing reservation seems to be essentially in line with the 'divide and rule' policy of British in India. 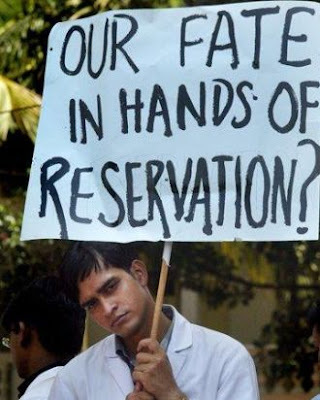 What reservation has done is to have made broadly two classes in India: those within the system and deriving benefits and those outside and considering themselves condemned. This has also led induced attempts of this inter-class influx both on the individual level and community level. For example, (at individual level) higher classes marrying with lower classes to derive the benefit of reservation and (at community level) entire community demanding to be declared as a backward class so that they could also be brought within the fore-fold of reservation. (2) No doubt that it is being described as a political tool and measure of 'vote-bank-politics', but I believe things need to be seen differently. When we initially thought that we would digress ourselves from the push-up theory and instead adopt the pull-up theory but that objective has not fructified. We have provided for reservation in seats in colleges etc. but we have been unable to find the required number of candidates to fill up those seats and avail the benefit. Instead what we find is an ever increasing number of seats being reserved without this being translated into meaningful terms owing to the inability of the system to induce the backward classes to come forward and take the benefits of it. (3) The social diaspora does not reflect in unequivocal terms the direction we need to adopt for future policy programmes. While there is intense demands for both; increasing the number of backward classes into the benefit availing segment, and diametrically on the other hand to end up with this system fully; the ins and outs of these are not sufficient to evolve a long-term objective to be pursued. In these circumstances, the best answer according to me lies in 'Subsidiarity'. It just requires a re-designing of the system in a manner that the benefits of the system peculate to the lowest level, which cannot be done in a manner better than one wherein it starts from the lowest level itself. By making the lowest cadre competent to realize the benefits for moving up-stream and tread on the path to progress, one may as well find the existing system working and bringing out better results. But then, again its a question of "political will" and "commitment" and cannot be achieved without determined outlook and valour.